We need to make the password of Oracle user more robust and make sure that the password are complex enough so that the chance of breaking them is minimized. 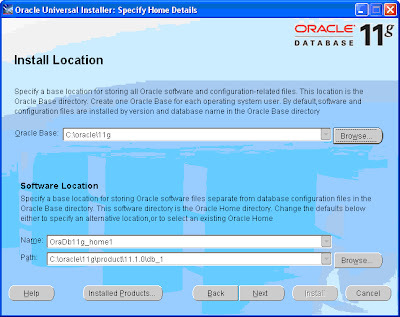 Oracle provides a script called UTLPWDMG.sql located in $ORACLE_HOME/rdbms/admin which can be used to manage the complexity of database password. This script basically creates to functions verify_function_11G (new in 11g) and verify_function (older version). 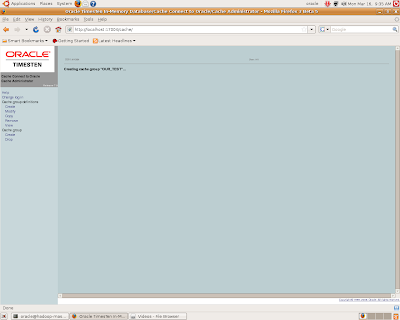 Lets see what verify_function_11G function does, its input parameters are username, new password and old password. Makes sure that the length of the password is more than 8. Makes sure that the username and password are not same e.g. username is SCOTT and the password is SCOTT. This check involves that the password can be in any case (UPPER CASE/LOWER CASE/Combination of Both) of the username, it will still reject the password. It basically compares lower(username)=lower(new_password). Makes sure that the password is not the reverse of the username. Checks for the case also, same as above. Makes sure that the password is not the same as the database name. Checks for the simplicity of the password, but I think this check is not so robust, as oracle just checks it against some pre-defined keywords: ('welcome1', 'database1', 'account1', 'user1234', 'password1', 'oracle123', 'computer1', 'abcdefg1', 'change_on_install'). Can't complain also, as its not really possible to compare it with the dictionary. These are some very common 8 letter passwords, people use. Makes sure that the password is not "oracle". This is a seperate check in the function, it could have been part of the above check. Makes sure that the combination is alpha numeric, basically atleast 1 character and 1 number. Makes sure that the new password differs from the new password by atleast 3 characters. I believe these are great checks to make sure that the new password are complex enough. we can also add more check if required, like add more keywords we dont want as password, check for upper case and lower case characters, and enforce that the password should have Upper case characters, make sure that teh password also has special characters like !,@,#,$,% etc etc. PASSWORD_LIFE_TIME 180 --> Days after which you need to change password. PASSWORD_GRACE_TIME 7 --> The time in days allowed after password expire, grace time. PASSWORD_REUSE_TIME UNLIMITED --> This parameter makes sure that you cannot use the same password again. PASSWORD_REUSE_MAX UNLIMITED --> This parameter makes sure that you cannot use the same password again. FAILED_LOGIN_ATTEMPTS 10 --> Allowed password retries in case of entering wrong password. PASSWORD_LOCK_TIME 1 --> Lock the user for 1 Day if it makes 10 failed password attempts. 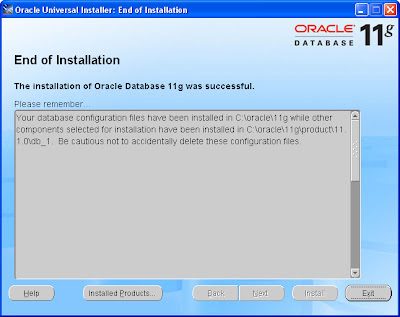 PASSWORD_VERIFY_FUNCTION verify_function_11G; --> Set the password managment function. Makes sure that the length of the password is more than 4. PASSWORD_REUSE_TIME 60 --> Can you the same password after 60 days. PASSWORD_REUSE_MAX 10 --> Can use the same password after using 10 different passwords after 60 days. After running the above script the default profile is set to verify_function_11G. The alter profile with verify_function is commented. But incase you want to revert to verify_function, you can do an alter profile as above. Check the ENDIAN format of the platforms. Both Windows and linux should have the same format. transported to the target OS, in the way it is currently. As we see no errors or message, so our database is ready to be transported to Windows 32-bit. Check if there are any external files associated with the database, they will not be transported using RMAN. The above directories exists in the database, we will need to recreate them with new locations once we complete the move. Now we need to use RMAN convert database command to convert the source database to windows 32-bit. The source database must be in read only mode. FTP the files to the windows server. I have used filezilla to copy the files to the windows server. Make required changes to the paths in the init ora file. Do a sanity check of the database. Database moved from linux to windows machine!!!! There another way to do the datafile conversion, we can convert the datafiles on the destination server also. The rman script changes a little in that case. The datafiles create by the above rman command should be copied to a temp directory on the destination server. 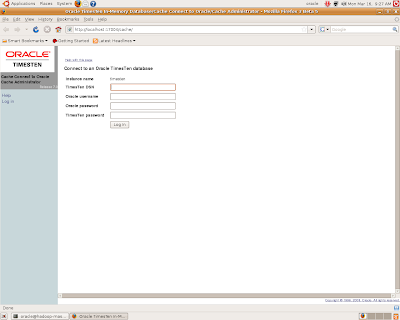 This will create a transport script to create the database instance on the destination server. It will also create a rman script to convert the datafiles on the destination server. After the conversion, run the transport.sql script after making the required changes. After you have opened the database the rest of the steps are the same. 2. Unzip the download and click on setup.exe. 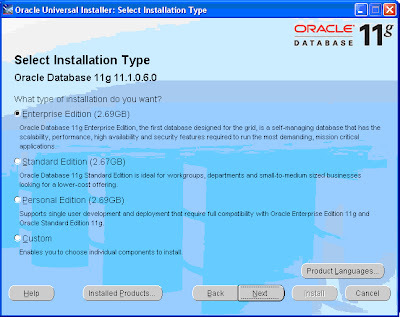 Select the basic installation of advanced. For our installation I am choosing advanced (Select Advanced and press next). Set the installation location. It takes about 2.77 GB of disk space (Set the installation location and press next). 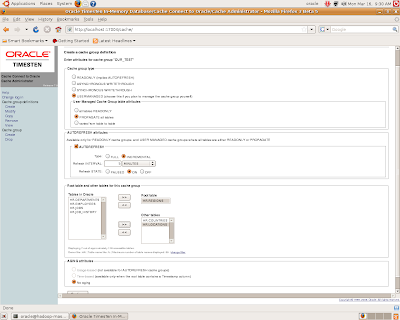 Oracle does some product specific prerequisite check (press next, fix if there are any issues). 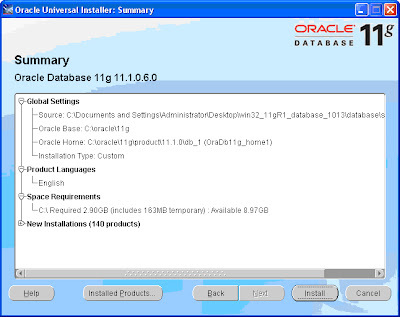 Select the database options you would like/need to install. I have selected all the options(Press Select all and press next). 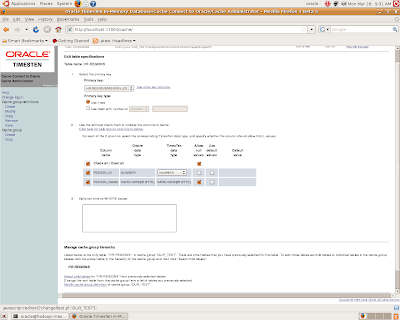 Ask if you want to create a database or an asm instance. 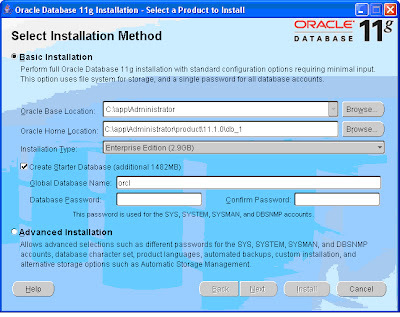 I will create DB and asm instance later(Select software install only and press next). 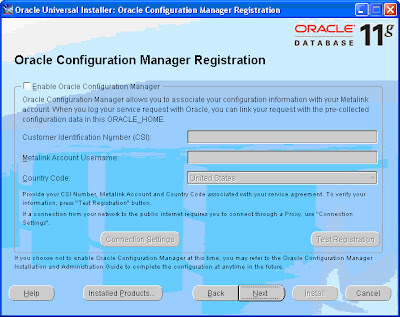 Information to connect to Oracle Configuration Manager. 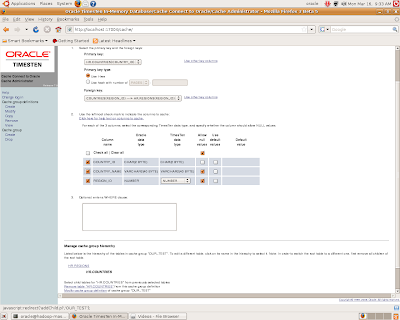 Requires information like the Oracle CSI number, metalink username etc (Press Next). End of successful install (Press Exit). But I received the error again. 16179, 00000, "incremental changes to \"%s\" not allowed with SPFILE"
// be made when using an SPFILE. // to be set in one ALTER SYSTEM/SESSION SET command. So now we have enabled archivelog mode and have some archivelog file also!!! In my previous blog, I had moved a lob from basicfile to securefile. I will use the same table for the dedupication example. I had five rows in that table, 3 had similar lob data. This command takes some time to run. Storage Stats after the deduplication. You can see that the Used Bytes column has come down visibly. As I had mentioned that there were 3 LOBs of the same size, which shows that the size has come down to 1/3rd. Let do the change from a BasicFile to SecureFile in 11g using a very basic example. Lets create a table with BLOB using BasicFile. Lets load some data into the table. Lets create a new table with SecureFile feature. Details of activity from v$sesstat, where 122 is our session id. Select Create under Create Cache Group Definitions. We will be creating a User Managed Cache Group Definition. We select User Managed, propogate all tables (from the attributes section), Autorefresh every 5 seconds(from the autorefresh definitions). Our Root table would be HR. REGIONS, child tables would be HR.COUNTRIES and HR.LOCATIONS. 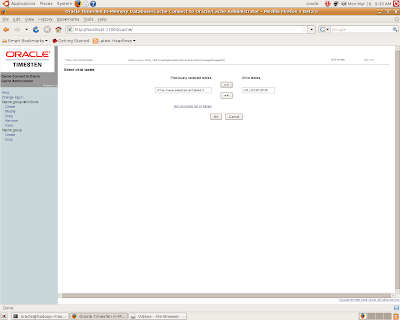 This will create the cache group called OUR_TEST. 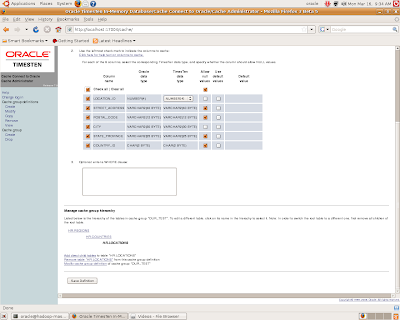 CREATE USERMANAGED CACHE GROUP "OUR_TEST"
Lets check the cache group we created using the cache administrator. 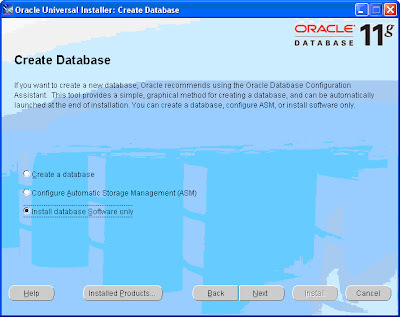 Copyright (c) 1996-2008, Oracle. All rights reserved. All commands must end with a semicolon character. Oops no rows show up....we still need to create a cache agent. Now lets check the record count again. We got the rows this time!!!! Check the Cache agent policy, by default its manual that means the agent will not start automatically when the timesten daemon restarts. Well the definitions works well!!!! 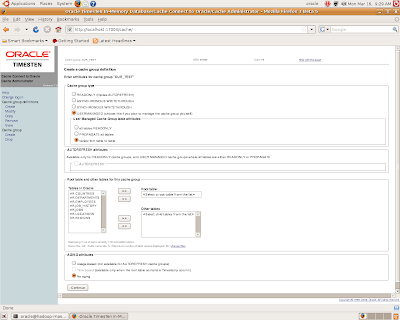 Cache groups are used to cache oracle database data in TimesTen in-memory system. You can either cache the whole table, or part of it by defining the columns. You cannot cache LOB datatypes as of now in TimesTen, the biggest available chumk is LONG RAW. You can create a cache group of multiple tables or single table as per your requirement. If you have multiple tables in a cache group you can define parent child relations. 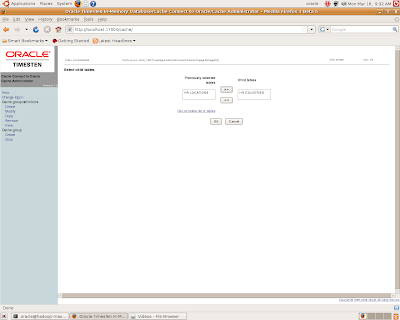 the tables do not necessarily need to be joined in the Oracle instance . There can be different types of cache group configurations, depending upon the requirements. -->READONLY - enforces a caching behavior in which updates on Oracle tables are applied to TimesTen through the AUTOREFRESH mechanism. -->SYNCHRONOUS WRITETHROUGH - enforces a caching behavior in which cached data is updated in TimesTen and propagated to Oracle. Updates to a SWT cache group are committed synchronously. -->ASYNCHRONOUS WRITETHROUGH (AWT) cache groups - enforces caching behavior in which cached data is updated in TimesTen and propagated to Oracle. Updates to an AWT cache group are committed asynchronously. -->USERMANAGED - Customizable/user defined cache group. Create the schema to be used for caching. 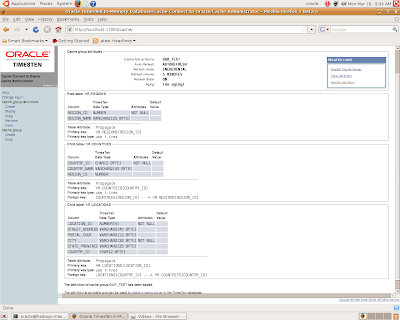 I am using the oracle provide "HR" sample schema on the oracle side. Need to add the entry of the dsn in the sys.odbc.ini file on the TimesTen server and sys.ttconnect.ini on the TimesTen client. Driver=/TimesTen/timesten/lib/libtten.so ##See the default one in the file and use the same path. Datastore=/TimesTen/data ##Defined the place where TimesTen can store the cache data. PermSize=16 ##Defines permanent size of the data store. UID=hr ##TimesTen user you created. Make sure that your environment has the correct location of the TNS_ADMIN variable. That means it points to the correct tnsnames.ora. So we were successfully able to create a read only cache group. 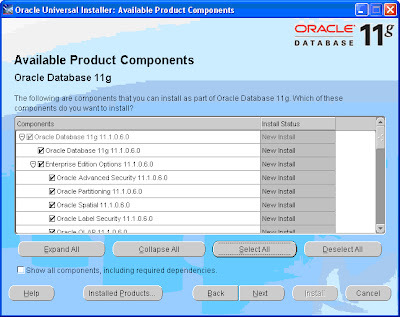 To test further, lets add data in the oracle database, as of now the table has 107 rows. We added 2 rows. Lets see if the record count in TimesTen has changed. This completed the testing for our cache group!!! Instance name will be 'timesten'. 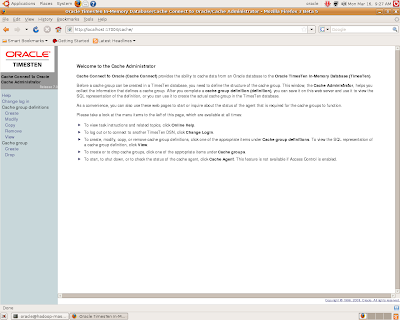 The directory /home/oracle/TimesTen/timesten/info does not exist. The default port number is 17000. The daemon will run on the default port number (17000). 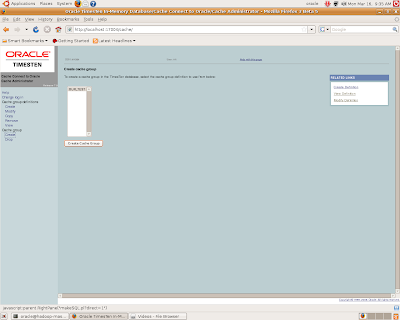 The directory /home/oracle/TimesTen/timesten/doc does not exist. Run the script '/home/oracle/TimesTen/timesten/bin/setuproot' as root.